A comprehensive guide for 3D printing with SLA covering the printing process, design specifications, material options and technology limitations. Stereolithography (SLA) is a 3D printing process that uses a laser to cure photopolymer resin layer by layer. SLA is best suited for producing small, smooth parts with fine details to a high level of accuracy. This article outlines the SLA printing process, presents the limitations and advantages of designing components to be printed with SLA and discuss the most common SLA materials. A typical desktop SLA machine will contain a UV laser to cure a specific layer of a component from a tank of photosensitive resin. The bottom of the tank is transparent and the UV laser is precisely controlled to trace a 2D contour of the object. The laser hardens (cures) the resin forming a solid layer. A very thin slice of the object is created with each pass of the laser. This thin slice is stuck to the layer before it (or the build plate) and the bottom of the tank. The newly printed layer is then separated from from the bottom of the tank (depending on the machine this can involve peeling, sliding or shaking the tank), the build plate then moves away 1 layer thickness and the process is repeated again until the part is completed. For an SLA print to be successful, reducing the forces on the newly printed layers during the separation stage is critical. 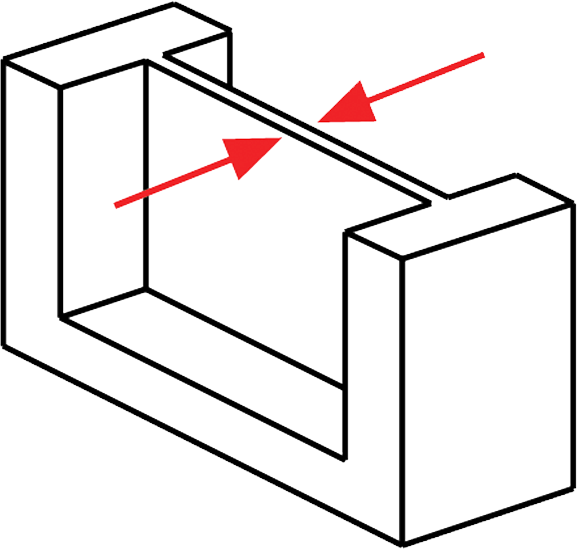 The separation stage creates areas of high stress along a potentially razor thin edge which can lead to a high part failure rate and warping (the part can stick to the tank bottom rather than the build plate). When orienting a part for SLA, the biggest concern is Z-axis cross-sectional area. The forces involved with a print sticking to the tank are directly proportional to the 2D cross-sectional area of the print. 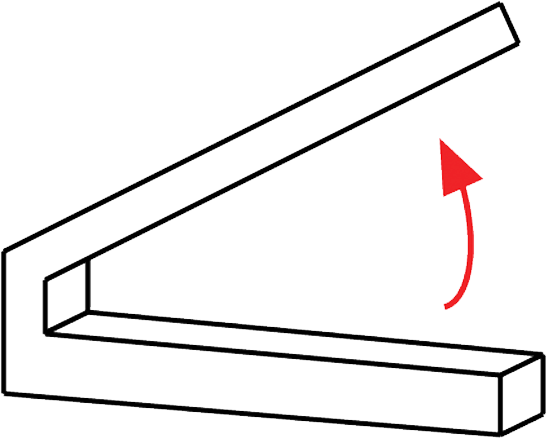 Because of this, the part is printed at an angle to the plate, and reduction of support is not a primary concern (as shown in the images below). Minimizing the cross-sectional area along the z-axis is the best way to orient parts for SLA prints. As a designer it is important to understand why part orientation impacts the quality of an SLA print. The necessity to orientate components so that the z-axis cross-sectional area is reduced often results in a significant amount of support needing to be added to the model. In some instances, a design may need so much support that printing in SLA is no longer cost effective or so detrimental to the appearance of the part (once support has been removed) that the end result is not visually satisfactory. Limiting the number of horizontal members, hollowing out components and reducing the cross-sectional area are all steps a designer can take to optimize a design for SLA. 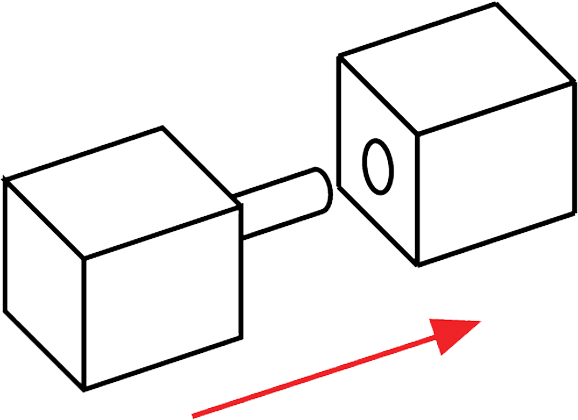 SLA prints are isotropic because the layers chemically bond to one another as they print, resulting in near identical physical properties in the x, y, and z-direction. 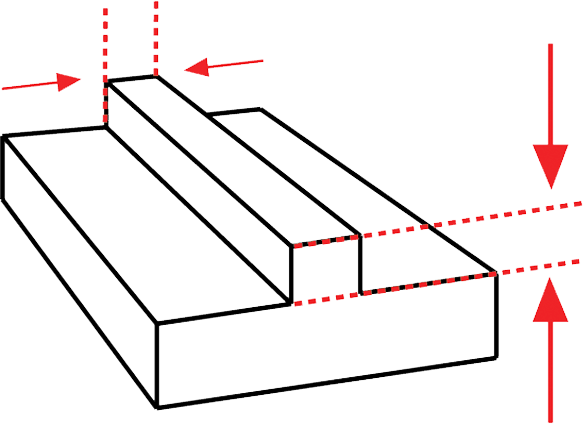 Whether the part is printed parallel or perpendicular to the build plate, the final material properties of the part will not be noticeably impacted. Supported walls - Walls that are connected to other structures on at least two sides, so they have very little chance of warping. These should be designed at a minimum of 0.4 mm thick. 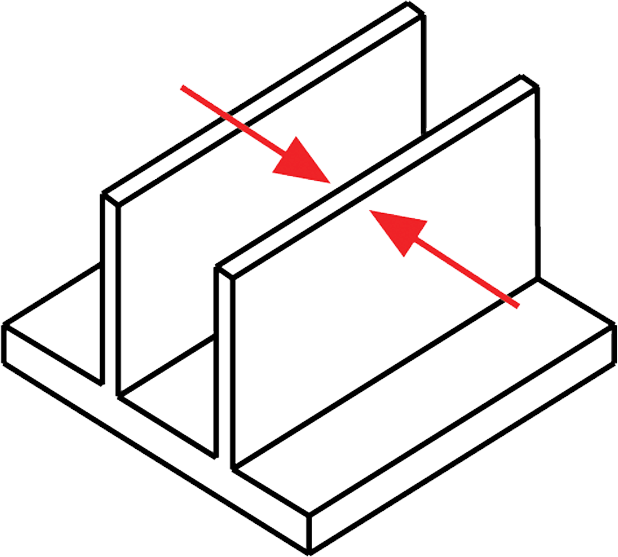 Unsupported walls - Walls that are connected to the rest of the print on less than two sides, and are at a very high chance for warping or detaching from the print. These walls must be at least 0.6 mm thick and should be designed with filleted bases (where the wall connects to the rest of the print) to reduce stress concentrations along the joint. Overhangs - Pose very little issue with SLA printing, unless the model is being printed without adequate internal and external support structures. Printing without supports often leads to warping of the print, but if printing without supports is necessary, any unsupported overhangs must be kept less than 1.0 mm in length and at least 19° from level. Embossed details (including text) - Any features on the model that are raised slightly above the surfaces around them. These must be at least 0.1 mm in height above the surface of the print to ensure the details will be visible. Engraved details (including text) - Any features which are imprinted or recessed into the model. These details are at risk of fusing with the rest of the model while printing if they are too small, so these details must be at least 0.4 mm wide and at least 0.4 mm thick (distance from surface of the model to recessed detail). 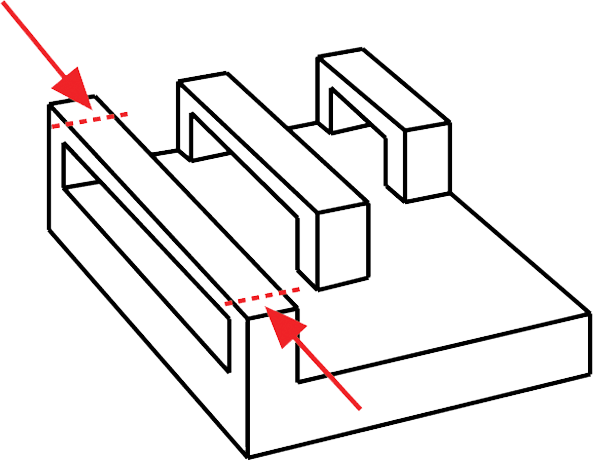 Horizontal bridges - Bridges between two points on a model can be successfully printed, but the designer must keep in mind that wider bridges must be kept shorter (less than 21 mm) than thin bridges. Wider bridges have a greater z-axis area of contact increasing the chance of print failure during peeling. 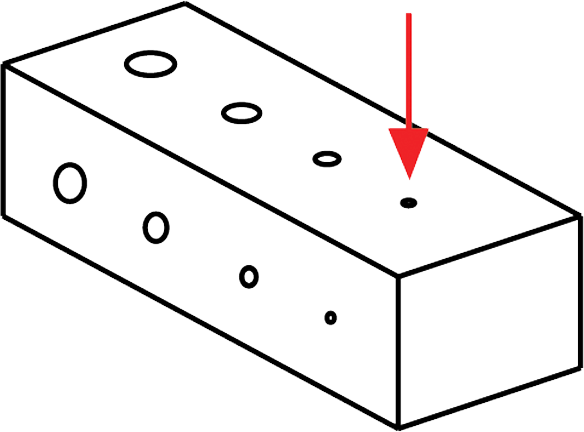 Holes - Holes with a diameter less than 0.5mm in the x, y, and z axes may close off during printing. 0.5mm clearance between moving parts. 0.2mm clearance for assembly connections. 0.1mm clearance will give a push or snug fit. SLA is able to achieve much higher resolutions than FDM because it uses a laser to solidify the material. 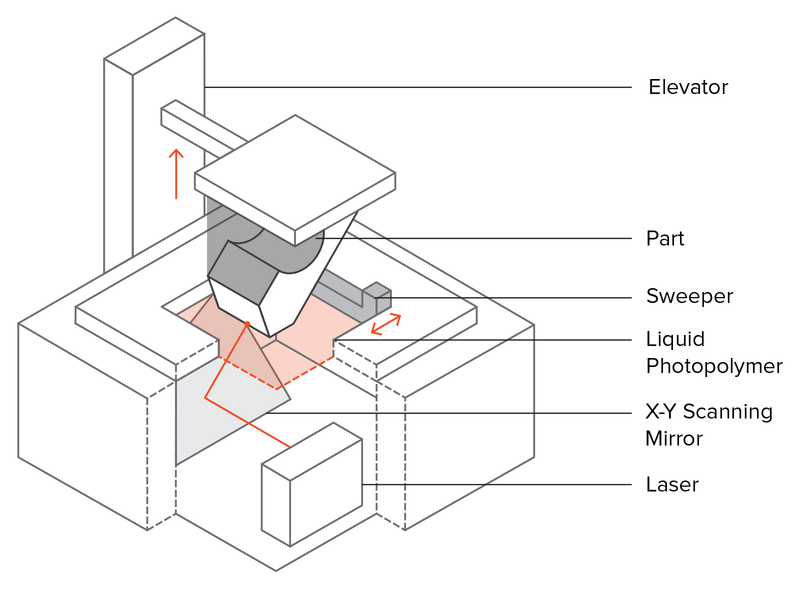 SLA printing resolution in the XY-direction (or horizontal resolution) is dependent upon the laser spot size and can range anywhere from 30 to 140 microns. This is not an adjustable parameter of printing. 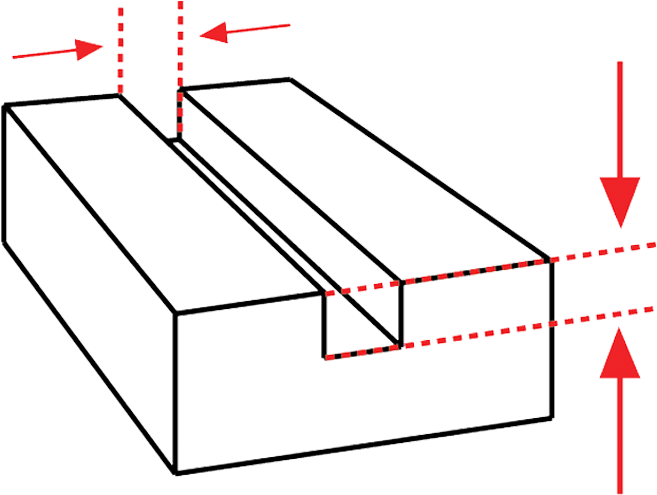 The minimum feature size cannot be smaller than the laser spot size. Resolution in the Z-direction (or vertical resolution) varies from 25 to 200 microns. Choosing vertical resolution is a trade-off between speed and quality. For a part that has few curves or fine details, there will be little visual difference between a print at 25 microns versus a print at 100 microns. By comparison, a desktop FDM machine will typically print z-axis layers at 150 to 400 microns. SLA machines print a solid, dense model but if the print is not intended to be a functional part hollowing the model significantly reduces the amount of material needed as well as print time. It is recommended that the walls of the hollowed print be at least 2 mm thick to reduce the risk of failure during printing. If printing a hollow part, drainage holes must be added to prevent uncured resin from getting trapped inside the final print. This uncured resin creates pressure imbalances within the hollow chamber, and will cause what is known as “cupping”. Small failures (cracks/holes) propagate throughout the part and will cause complete failure, or part explosion, if not corrected. Drain holes should be at least 3.5 mm in diameter, and at least one hole must be included per hollow section. The table below identifies some of the more common SLA resins. Standard resin Most commonly used for general printing and can offer high detail surface finishes with resolutions smaller than 25 microns. These resins offer no special material properties and are typically more brittle than standard FDM materials. Ideal for high detail prototyping or models that are not functional. Engineering resins SLA resin manufacturers more recently have been pushing into the engineering sector by simulating common engineering plastics offering ABS or polypropylene-like, flexible and high temperature resins. These resins offer superior engineering properties without sacrificing print quality but come at a higher cost. Tough, flexible and high temperature applications. There are a range of surface finishes that can be achieved on SLA printed parts. The desired surface finish is often governed by cost and application. For a detailed guide on the most common SLA surface finishes refer to this article. SLA printers generally have a much smaller build volume than most FDM printers, with the exception of commercial machines. The Formlabs Form 2 (a common desktop SLA printer) has a build volume of 145mm × 145mm × 175mm while the Ultimaker 2+ (a common FDM desktop printer) offers 223mm × 223mm × 205mm. When SLA print geometries exceed the printer capacity they can be printed in smaller sections and then assembled. The best method for bonding SLA printed components together is a 5-30 minute epoxy. The cost by volume of SLA resin compared to the filament used for FDM printing is higher. Because of this SLA prints are usually more expensive however the ability for SLA to print intricate details means it is a competitive option when compared to many of the more industrial 3D printing technologies. A liter of standard SLA resin typically costs around USD$150 while a 1kg roll of ABS filament for FDM will cost around USD$25. SLA parts are generally not suited for producing functional parts that are subjected to loads. The nature of SLA resins means that parts are brittle, not as stable as other 3D printed materials over long periods of time and do experience some creep. Most SLA printed parts require curing in a UV chamber post-print. Post-curing enables parts to reach the highest possible strength and become more stable. SLA is ideal for small parts that require a smooth surface finish (comparable to injection molding) and a high level of accuracy. 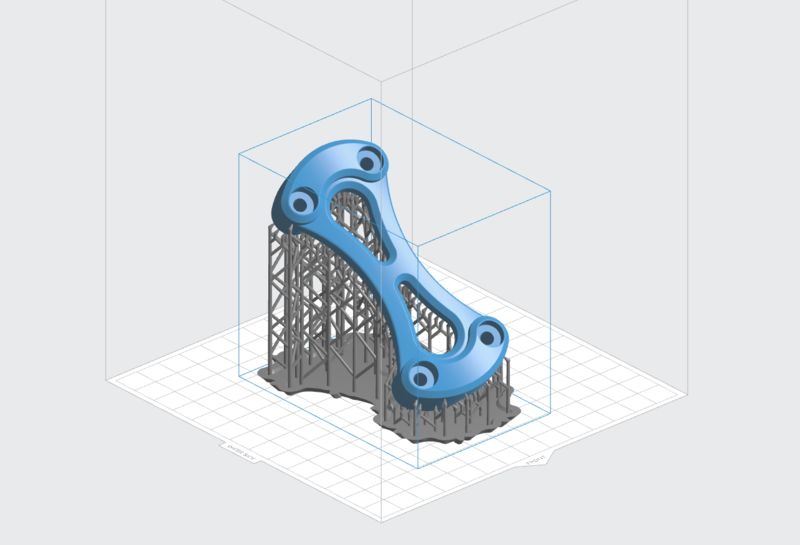 Support structures are critical to successfully printing accurate SLA parts. If a good finish is required on a surface the part should be orientated so that that surface is not in contact with support material (typically upwards facing). SLA parts typically have poor mechanical properties and are best suited for non-functional prototyping, enclosures and visual models. Supported walls At least 0.4 mm thick. Overhangs Less than 1.0 mm in length and at least 19° from level. Enza3D's Hub – Enza3D is located on Long Island, and provides printing service for the greater metropolitan area. The Hub prints in a variety of filament, but specializes in exotic filament for FDM printing and SLA printing. Enza is home to mechanical engineers, and happily provides engineering consulting services in addition to 3D printing. 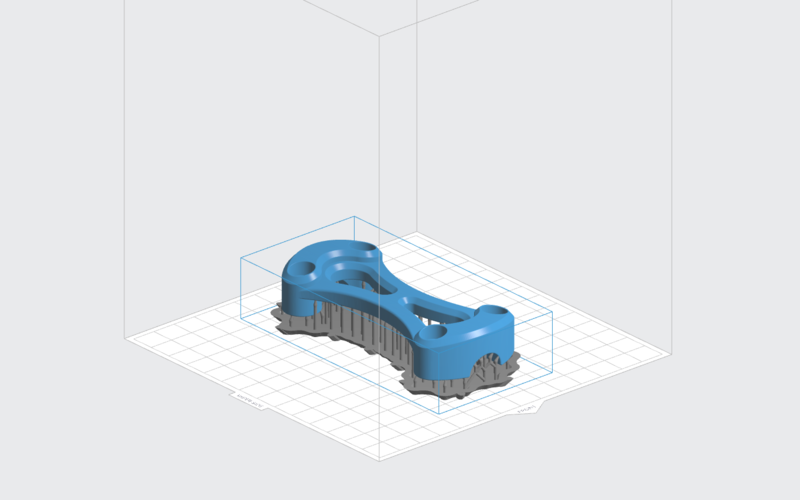 This article discusses how to design SLS 3D printed parts including technical design specifications, materials, limitations and an introduction into the post-processing options available.